This morning I got a note from one of Michigan in Pictures’s longtime contributors, Joel Dinda letting me know that I had coincidentally featured his photos twice on previous January 5ths. The other two were Rotten Apples: 2014 Detroit Lions Playoff Edition detailing the Lions’ loss to Dallas after the pass interference call that was and then wasn’t and a look at the Ruins of the the Old Cheboygan Point Lighthouse in 2013. The third time is the charm they say, so here’s one that Joel shared way back in January of 2006 (taken summer of 2005) as part of his “Flower a Day” series. I think he started doing them in January and then realized somewhere along the way that as bad as Michigan winter in January can be, Februarys are worse!! View Joel’s photo background big, see more in his in his Flower a Day for February (x9) slideshow, and check out photos from Joel dating back a decade on Michigan in Pictures! Bob took this shot of a photographer on Grand Haven’s North Pier with more guts or maybe less sense than most. I bet his photo was pretty sweet though! View it bigger and see more in his slideshow. This exhibit focuses on the ever-changing shape of the shores of Lake Michigan. The lakeshore is currently experiencing erosion similar to that of the mid-1980’s and late-1990’s. At that time those dwelling on the lakeshore hastened to build the seawalls and jetties which would fortify their properties and homes from the obliterating effect of the waves pushing out of the rising water. Eventually, as the water receded, the sand returned to build up the shoreline and bury the wooden structures that were erected there. Now, as Lake Michigan moves through its rhythms once again, the water is advancing and the sands retreating, exposing the old, decaying seawalls. I have created a photo-journal of this changing shoreline scenery, featuring the old seawalls and jetties as aged reminders of the cycles which are characteristic to our natural world. You can watch an interview with Tony at WOOD-TV, learn more at the ArtPrize page on his website and check the exhibit out in person at Crossroads Bible Church (800 Scribner NW). As the mercury climbs and some crazy people (such as yours truly) start grumbling about the high temps, it’s probably a good time to take a look back at last winter’s spectacular ice caves. In the heart of winter, when the drifts are as high as houses and snow-dusted pines line the roads, photographers travel to the Upper Peninsula in search of crystal. Not antique-store crystal, but Superior crystal, the kind that occurs when the north wind turns every drop of open water into something sparkling and new. During the coldest months, the great lake freezes, heaves and breaks, forming mountains of crystal rocks, so tall they seem like permanent landforms. Icebergs and volcanoes rise in the harbors and bays, reflecting all the colors of the sky. Waterfalls slow from a rush to a trickle, building columns that bubble and sing. And, on the sandstone cliffs, springs that flow unseen in the summer months create glittering ice curtains. During winter’s last stand, at the very beginning of March, I headed north to find Superior crystal. My trip was inspired by winter photographs of the U.P. that I’d viewed online. I’d seen dramatic images of enormous frozen waterfalls, great Superior ice fields, and shining rivers wreathed in morning mist. I wanted to experience and photograph all those scenes, but more than anything, I wanted to see the legendary ice curtains of Grand Island in Munising Bay. These immense, aqua blue ice curtains form when cold temperatures freeze the springs that seep from the island’s rocky cliffs. It can be tricky to get to the ice curtains, though. The island is not accessible every winter because the currents are strong in the bay, preventing adequate ice buildup. During last year’s historically cold winter, the bay froze sufficiently to allow foot traffic. For awhile it looked like Grand Island would not be accessible this year, but February’s arctic blast arrived just in time. View Craig’s photo bigger and see & purchase more in the Grand Island Ice Curtains – Munising gallery on Craig’s website. PS: The Grand Island National Recreation Area is located just off the coast of the UP in Munising and is an amazing place, complete with mountain bike trails! 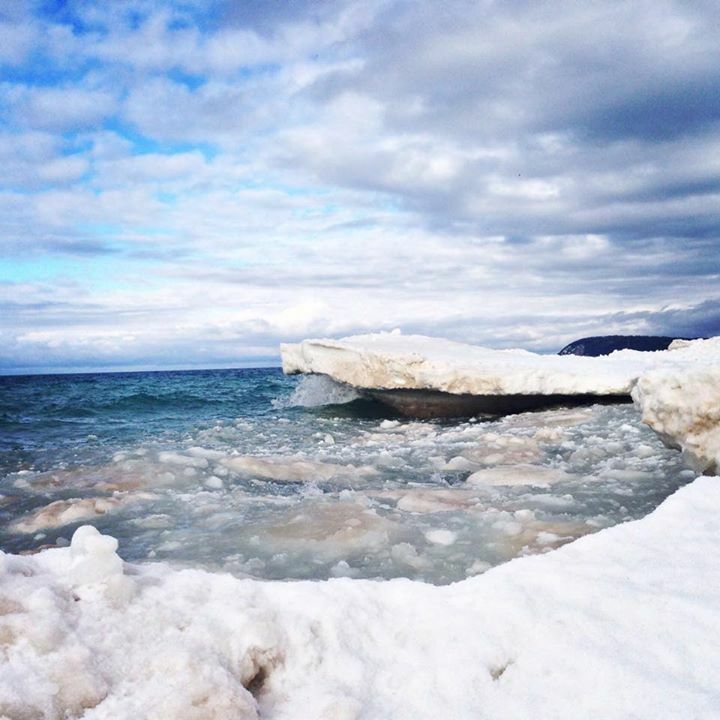 PPS: More ice caves on Michigan in Pictures too! PPPS: I really am a fan of the PS. If you are too, please PS in the comments! One of my favorite Michigan fine art photographers is Bill Schwab, and I still remember the day when I pulled up the Absolute Michigan pool on Flickr to find he’d added some of his photos to the group, including the one above. Fine art photographer, Bill Schwab has been taking photo-expeditions to Iceland since 2009. He will share some of his favorite photographs of Iceland’s harsh, yet beautiful, landscape. Schwab is also the founder of PhotostockFest held annually in Harbor Springs. The Artists Adventure Lecture Series are free and open to the public. Click above for more on the event and visit the Charlevoix Circle of Arts for more about them. Bill’s PhotostockFest takes place June 18-21 and you can register and get details on workshops and the event at that link. My father’s side of the family was very much into photography. My Great Grandfather, Frederic C. Lutge had a portrait studio in late 19th and early 20th century Detroit and it branched out from there. My father always had interesting cameras and my uncle had a darkroom. I was fascinated by the gear. Even when I was too young to have a camera, I would draw pictures of them. After cutting them out I would pretend to use them and then draw the pictures “taken” with my cut out cameras and show them to people. Apparently I was hooked at an early age, but it wasn’t until I was twelve that I started processing and contact printing my own film from an old Ansco kit. After that, it is all a blur. …Growing up in Detroit, pretty much everyone worked in the automobile manufacturing industry and I knew very well at a young age that wasn’t going to be my destiny. I can remember very clearly my dad asking me what I wanted to be at about age five. I said that I would get a job like his and he basically said, no way. Then there was my mom with her unbridled curiosity. She was an early news junky and I seriously think she missed her calling by not going into journalism. The major happenings of the day were right there on the TV during dinner and I was very aware and interested in what was going on. We had subscriptions to Life Magazine and Look and I loved to go through the pages looking at the photographs. Read on for lots more and some beautiful photos. 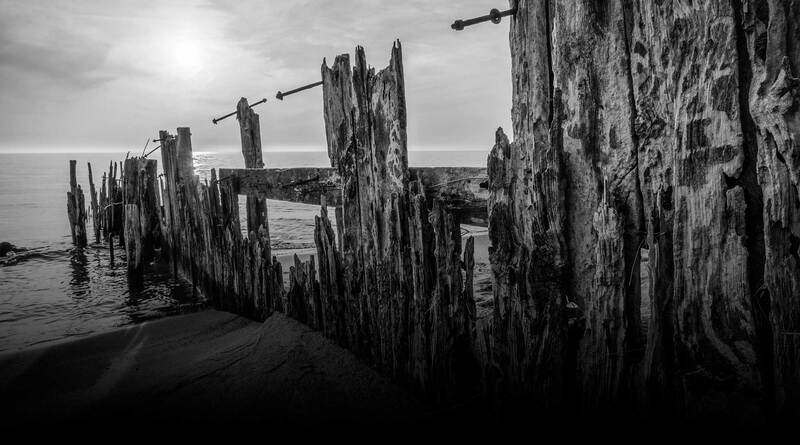 View Bill’s photo of the ruins of the pier at Cross Village bigger on Flickr and see lots more from across the state in his Michigan slideshow. You can view and purchase prints at billschwab.com. He’s a good follow on Facebook and also just started up an Instagram @bill_schwab, so you might want to follow along there too! More Michigan photographers on Michigan in Pictures. Every so often I have to write a post to clarify what Michigan in Pictures is or is not, and I guess that today is one of those days. Sunday morning, I posted this photo (also at the bottom of this post) to the Michigan in Pictures Facebook page with the very accurate caption “We went out to Good Harbor Bay on Lake Michigan yesterday to play on the ice!” As you can see from the photo, Laura is positioned well back from the edge. While perhaps not perfectly safe, she is far safer than she was driving to the beach. Shelf ice is indeed dangerous if you don’t know where you are and what you’re doing. The water where we were is 3′ deep in summer and the ice very solid, so in my opinion, play is exactly what it was. Your concern for safety is good, but if you take proper precautions, you’re a heck of a lot safer here than driving on a winter road. I post pictures all the time where the photographers have taken calculated risks to see, photograph and experience things that you cannot see and photograph without an element of risk. I allow my son to surf in conditions that can be very dangerous, let my daughter climb trees high enough to probably kill her if she fell, and hiked on trails where one slip meant death. View my photo background big and see more on our mileelanau Instagram. PS: Thanks to Kate Wittenberg for the perfect William G. T. Shedd quotation that she shared in the comments! PPS: Here’s the photo Laura shot. Position, framing, tone.